The purpose of this paper is to examine and explain the complex interrelationships which influence the ability of firms to create value for their providers of finance and other stakeholders (loosely referred to in practice as “integrated thinking”). In doing so it examines the interrelationships between: environmental, social and governance (ESG) risk; delivering on corporate strategy; non-financial corporate reporting; and, board oversight. Methodology Interviews were conducted with board chairs and non-executive directors of large listed companies on the Johannesburg Stock Exchange (where Boards are required to have a social and ethics sub-committee and approve integrated reports which have been mandatory since 2010) and the Australian Stock Exchange (where Board directors’ liability legislation results in Boards being reluctant to adopt integrated reporting which is voluntary). Findings The research finds that contemporary reporting processes, and in particular those set out in the King III Code and the International Integrated Reporting Framework, influence cognitive frames enhancing board oversight and assisting organisations in managing complexity. This results in increased awareness of the impact of ESG issues together with a broader view of value creation despite investor disinterest. Research implications A number of avenues of research are suggested to further examine the interrelationships identified. Practical implications The research assists the development of practice and policy by articulating and enhancing the understanding of linkages, which loosely fall under the vague practitioner term “integrated thinking”. Social implications The conceptualisation can inform national and global discussions on the appropriateness of corporate reporting and governance models to achieve sustainable development and contribute to the sustainable development goals. Originality/value The cross-country comparison allows an assessment of the extent to which different national social contexts with differing governance and reporting frameworks lead to different perspectives on, and approaches to, value creation. The fields of practice of environmental, social and governance (ESG) risk management and its incorporation into strategy, accounting and operational risk reporting have developed rapidly over the last decade or two. The corporate sector is addressing perceived increased interconnectivity between social, environmental and economic performance. Practitioners and scholars are grappling with increased interconnectivity between corporate reporting, risk, governance and performance and the complexity that entails. This increased complexity and unpredictability of relationships between relevant phenomena requires new theorisations in order to move towards a more multifaceted and interacting approach to social, environmental and economic sustainable development (Unerman and Chapman, 2014). Scholars have called for a review of extant theoretical insights and a development of theoretical frameworks to structure researchers’ observations of practice and to enable the communication of new understandings (Adams and Larrinaga-Gonzalez, 2007; Adams and McNicholas, 2007; Contrafatto, 2014; O’Sullivan and O’Dwyer, 2015; Parker, 2005; Unerman and Chapman, 2014). The paper examines contemporary and emerging interrelationships between: ESG risk; delivering on corporate strategy; and, corporate reporting, particularly non-financial reporting: from the perspective of board directors and insofar as they influence a company’s ability to create value for its stakeholders. Creating value for stakeholders has been explicitly linked to creating value for shareholders by both framework setters and reporters. Interviews were conducted with 16 directors including board directors of large listed companies on the Johannesburg Stock Exchange ( JSE) and the Australian Stock Exchange (ASX). These two countries are of particular interest due to the different nature of corporate reporting, governance and external contextual factors. In particular, integrated reporting is mandated for companies listed on the JSE and discouraged in Australia by regulation relating to directors’ liability (see Huggins et al., 2015). The interviews sought to gauge: approaches to ESG risk governance; understanding of the nature of ESG risk issues and their relevance to long-term strategy; and, the role that corporate reporting has played in informing their views. By nature of their position, the interviewees are amongst the most influential people in the world with respect to aligning business outcomes with outcomes for society. Board directors, also referred to as Non Executive Directors (NEDs), of large complex companies are generally required to have held senior management positions, often as Chief Executive Officer (CEO), and hence have an appreciation of the interrelationships between the different factors and actors examined in this paper. Collectively Board Directors are ultimately responsible for risk governance and developing and delivering on strategy to create value. The paper draws on both theorising in the quality accounting and management literature and empirical research highlighting new practice developments. The approach was informed by informal conversations with board directors, chief financial officers and heads of sustainability through various forms of engagement work. Rather than focussing on any one theory, one aspect of the transformation process or the interrelationship between any two pieces of the puzzle, this paper takes a holisitic approach to enhance our understanding of the various elements contributing to the ongoing transformation and the interrelationships between them. In doing so it identifies aspects that warrant further research. A key contribution of this paper is a nuanced understanding of the interrelationships which influence value creation depicted in Figure 1 below. Figure 1 draws on recent literature, prior theorising, the author’s prior engagement work and insights from the interviews with business leaders in two countries, South Africa and Australia, with very different contexts with respect to the three influencing elements of the conceptualisation, external contextual factors, board governance and corporate reporting (processes). The approach used in this paper is inductive. Prior to the turn of the century theorising in corporate social or sustainability reporting occurred deductively (see Parker, 2005) focussing almost exclusively on corporate characteristics (such as size and industry grouping) and general contextual factors (such as the social, political and economic context) with a (unidirectional) influence on reporting (Adams, 2002). Parallel to this, corporate sustainability reporting in practice was conducted with little interaction with other corporate functions with consequently limited ability to effect change. In response Adams (2002) called for more case study work examining internal contextual factors and in recent years a growing body of research has sought to understand the inter linkages between corporate sustainability reporting practices and other organisational functions with increasing recognition that internal factors both influence and are influenced by reporting practices (see e.g. Adams and McNicholas, 2007; Correa and Larrinaga, 2015; Cho et al., 2015; Lodhia, 2015; Milne and Gray, 2013; Queen, 2015). This work has increasingly drawn on broader management and social science theories to understand (impediments to) particular aspects of the transformation processes such as, for example, the role of social actors or stakeholders in the transformation (see e.g. Adams and Whelan, 2009; Archel et al., 2011;Gray et al., 2014;Hall et al., 2015), or the role of individual organisational actors (Cho et al., 2015; Hahn et al., 2014). The next section develops a contemporary conceptualisation of the value creation process. The findings section illustrates the complex relationships between the organisational context and approaches and practices presumed to lead to value creation which are analysed according to the conceptualisation. A key finding is that corporate reporting frameworks have a significant impact on the mindset of corporate leaders with respect to social and environmental issues and value creation. The paper concludes with regard to potential of corporate reporting to influence cognitive frames and thus enhance corporate contribution to sustainable development, societal and environmental well-being and corporate competitiveness. This section reviews the academic literature and developments in practice and policy which informed the conceptualisation of the value creation process (see Figure 1) concerning the assumed relationships between the various factors influencing corporate value creation. In the field of practice the term “integrated thinking” has been used to discuss the process of developing an integrated report and/or creating value beyond financial profit. But the conceptualisation of these processes and interrelationships is underdeveloped. This section aims to address this through what Llewellyn (2003) refers to as level three and four theorising. Llewellyn (2003) argues that concepts are essential to praxis and constitute theories of practice and that the introduction of new concepts (level three theorising), such as “integrated thinking”, represent new ways of thinking and acting allowing practical developments in the world to be discussed. Llewelyn’s level four theorising involves tying together a range of differentiations and concepts to construct broader schema which explain “specific social, organisational or individual phenomena in their settings” (p. 674). Evidence of the impact of corporate governance scandals, supply chain human rights and labour issues and environmental disasters suggests that ESG risk and opportunities are increasing as a factor determining corporate success. Other external factors that influence the relationship between ESG risk and opportunity, strategy and value creation (the blue box in Figure 1) could include social and environmental issues at the global (such as those in KPMG, 2011), regional or national levels and the actions of stakeholders and social actors (see e.g. Adams and Whelan, 2009; Archel et al., 2011; Gray et al., 2014; Hall et al., 2015). The conceptualisation of the value creation process is discussed in three stages. The interrelationship between ESG risk and opportunity, strategy and value creation (depicted in purple circles in Figure 1) and the impact of external contextual factors is discussed first. Second, the role of corporate reporting and reporting processes and governance in shaping those linkages to create value is discussed. Lastly, the role of individual actors and leadership in tempering the links between ESG risk and opportunity, strategy and value creation and the interplay with corporate governance, reporting and external contextual factors is discussed. This section examines the (perceived) relationship between ESG risk and opportunity, developing and delivering on strategy and creating value. The ever increasing corporate social and environmental disasters impacting reputation, relationships and profit since the advent of globalisation has highlighted that delivering on strategy and long term corporate success is dependent on the effective management of ESG risks and opportunities (see e.g. Adams 2013a; Adams et al., 2013; Coulson et al., 2015; EY, 2013; KPMG, 2011; van der Vegt et al., 2015). Further, it seems reasonable to assume that a range of external contextual factors including both social and environmental factors and institutional factors, will influence not only the nature of ESG risks and opportunities, but also how those risks and opportunities impact on value creation. KPMG (2011) which identifies global sustainability megaforces impacting on business clearly expects this to be the case, but little is known about the extent to which or how these megaforces influence strategy. With regard to institutional factors there is some evidence that: investors increasingly seek information on ESG issues (see e.g. ACCA and Eurosif, 2013; ACSI, 2014, 2015); there is a strong dissatisfaction with the level of information currently provided (ACCA and Eurosif, 2013); and, over time analysts are assessing firms with high CSR ratings more optimistically (Ioannou and Serafeim, 2015). Further, interviews with 20 members of the South African institutional investor community conducted by Atkins and Maroun (2014) found that “interviewees were clearly aware of the financial significance and materiality of ESG issues”( p 10). This is perhaps not surprising given that the majority of the Atkin and Maroun sample were ESG/CSR analysts (seven), followed by investment analysts (four) then asset managers (three). Likewise, it might be reasonable to expect pension funds and institutional investors with their longer term focus to have a higher level of understanding of the importance of ESG risks to financial returns than other investor groups. Recent annual reports of Cbus and VicSuper superannuation funds indicate that this is the case. The ACSI (2014, 2015) has the support of ASX investors in its push to increase corporate information provision on ESG risks. In contrast, Solomon et al. (2013) found evidence that investors subordinated social and environmental information to financial information in private discussions which were consequently exercises in impression management. The authors linked the lack of rigour in investor questioning with weak governance structures, poor social and environmental stewardship and the blind pursuit of profit. Yet despite an increasing acknowledgement of a link between ESG risk and opportunity and value creation, ESG risk has traditionally not been factored into corporate risk registers (CPA Australia et al., 2014). An examination of reports of ASX 50 companies by the ACCA and Net Balance Foundation (2011) pointed to poor management of ESG risks with only 70 per cent of these top 50 companies disclosing policies in place to manage ESG issues and only 36 per cent reflected an ESG focus in their company purpose and value statements. Further, the CPA Australia et al. (2014) study concluded that many ASX 50 companies “did not demonstrate an understanding of the complex, systemic and compounding nature of the megaforces” (p. 8, CPA Australia et al., 2014 referring to the ten sustainability megaforces identified in KPMG, 2011). Only three of the ten megaforces, climate change, energy and fuel and population growth were identified by all 50 companies. Further, the study found a lack of linkage between the megaforces and value drivers in corporate reports. Drivers of corporate value associated with the megaforces in order were: brand value and reputation; productivity; risk profile; licence to operate; and, attracting customers. These developments and research findings indicate a perceived link between ESG issues and value creation for shareholders, but a lag in corporate and investor responses. Nevertheless, it is reasonable to expect that corporate strategies, the achievement of which is a board responsibility, will incorporate consideration of ESG issues. The next section considers contextual factors that might influence this interplay. There is a vast literature on the role of reporting as a constructed and constructing tool shaping both management practices and society (e.g. Burchell et al., 1985; Miller, 1991; Milne et al., 2009). Accordingly, Figure 1 reflects assumptions inherent in policy developments that corporate reporting (process) and governance practices influence the extent to which ESG risks and opportunities are linked to strategy in order to create value and the contextual factors which influence that process. This section examines the role that reporting frameworks and board involvement in reporting processes might play in raising awareness of ESG risks and opportunities and incorporating them in strategy development. Reporting frameworks concerned with non-financial reporting, such as those of the international integrated reporting council (IIRC) and the global reporting initiative (GRI), are increasingly specifying processes of reporting and thus influence management actions and thinking. Board involvement is increasingly seen as essential for the effective integration of environmental and social sustainability into corporate practices (Adams, 2013b; Eccles and Serafeim, 2011), but evidence regarding the extent of that involvement in practice is limited. Whilst focus on these issues is generally CEO led, the board’s involvement through, for example: including social and environmental KPIs in executive remuneration determinations; signing off on sustainability and integrated reports and sustainability disclosures in annual reports; and, ensuring that ESG risks inform strategy and are included in risk registers: can be critical in embedding management led initiatives. And, if we accept that long term corporate success (as well as the survival of the human race) requires integration of sustainability thinking into corporate practices (see Adams, 2014; KPMG, 2011), it is clearly in the board’s interest to do so. Further, the board appoints the CEO and CEO ethical leadership has been found to have a positive influence on an organisation’s ethical culture which in turn has a positive influence on firm performance (Eisenbeiss et al., 2015). The IIRC (2013) encourages Boards to take responsibility for integrated reports and to disclose the nature of their oversight of its preparation. It seems logical perhaps that this would be seen to be in the interests of board directors given that they are responsible for strategy (which is disclosed in an integrated report); and, delivering on strategy is dependent on sound risk governance (including ESG risks), a board responsibility. Proponents of integrated reporting argue that the multiple capital model of integrated reporting could further facilitate the integration of sustainability issues into corporate thinking (see e.g. Adams, 2015; Coulson et al., 2015) whilst critics contend that it has not lived up to its promises on sustainability disclosures (see e.g. Flower, 2015). Further there are dissenting voices with regard to attempts to connect sustainability accounting and reporting with increasing profit (or value) with Gray (2006) describing them as misguided (see also Milne and Gray, 2013; Milne et al., 2009). Indeed a desired purpose of sustainability reporting is accountability to key stakeholders (Gray et al., 2014) rather than creating value for owners. Linked to increasing interest in corporate ESG performance, there are international discussions (e.g. those led by UNCTAD ISAR and the corporate reporting dialogue) on the future of the corporate reporting model to achieve sustainable development and the sustainable development goals (SDGs) developed by the United Nations (2014). During 2015 the Global Reporting Initiative (GRI), UN Global Compact and World Business Council for Sustainable Development (WBCSD) collaborated to produce a consultation document to assist companies in aligning their reporting and performance with the SDGs. This partnership between three organisations which have already significantly increased corporate attention on ESG issues (see e.g. GRI, 2014; UNGC, 2010) may further influence the integration of social and environmental sustainability issues into mainstream corporate practices, including corporate reporting and strategic planning. The assumption inherent in many of the developments discussed above is that corporate reporting and governance processes not only influence what is visible, but also change corporate actions (Burchell et al., 1985; Henri and Journeault, 2010). Indeed, there is a significant body of work examining how accounting (and hence reporting frameworks which influence the account that is provided) influences strategy (see e.g. Dent, 1990; Roberts, 1990; Skaerbaek and Tryggestad, 2010). “Accounting is an integral part of framing strategy, that is to say the accounting devices become strategic in a role of (re)formulating strategic ends and rationales, rather than being limited to implementation” (Skaerbaek and Tryggestad, 2010, p. 121). There is already evidence of integrated reporting having perceived strategic benefits (see e.g. Cheng et al., 2014; Simnett and Huggins, 2015; Black Sun and IIRC, 2014) including the breaking down of silos, greater collaboration, better understanding among finance teams of the financial impacts of non-financial performance, improvements in decision making, better collaborative thinking by the board about goals and targets, and a better understanding of risks and opportunities. Contrary evidence is provided by Stubbs and Higgins (2014) who found no indication that integrated reporting was changing organisations’ interpretive schemes or value systems (see Laughlin, 1991). Notwithstanding perceived benefits, in the Australian context, the Australian Institute of Company Directors (2014) has argued strongly that both integrated reporting and the requirements of the Australian Securities and Investments Commission’s Regulatory Guidance (RG) 247 (ASIC, 2013) pose “significant risks” particularly in relation to the disclosure of forward looking information, including qualitative information, and directors’ liability. It would be reasonable to presume that the legislation (Australian Corporations Act, 2001) regarding directors’ liability and the attention given to this issue in Australia has been a barrier to the take up of integrated reporting in Australia (see Huggins et al., 2015 for a discussion of this issue). There are an increasing number of voluntary and regulatory frameworks concerned with the disclosure of both ESG risks and corporate strategy. Revisions to the ASX Corporate Governance Principles effective for financial periods beginning on or after 1 July 2014 require companies to disclose economic, environmental and social sustainability risks on an “if not, why not” basis. Specifically, Recommendation 7.4 requires companies to state how they manage, or will manage, such material risks. The ASIC (2013) Regulatory Guide 247 requires listed companies to prepare an operating and financial review which discusses (amongst other things) environmental and other sustainability risks which could affect the company’s financial performance (RG247.63). RG247.62 contains a forward looking disclosure requirement pertaining to the likelihood of risks increasing or decreasing and their potential impact on the company’s prospects. In contrast to Australia, in South Africa, the King Code of Governance Principles for South Africa of 2009 (King III) required companies listed on the JSE to issue an integrated report which incorporated sustainability reporting for financial years commencing on or after 1 March 2010 (see Steyn, 2014). King III also contains a number of principles including that: the board should appreciate that strategy, risk, performance and sustainability are inseparable; and, the board should appreciate that stakeholders’ perceptions affect a company’s reputation. The conceptualisation in Figure 1 acknowledges the role of reporting and governance practices in constructing change and the extent to which companies embrace change towards sustainable development is influenced by individual actor cognitive frames and by leadership (Christensen et al., 2013; Cho et al., 2010; Hahn et al., 2014). The literature recognises that aspirational future talk may serve to mobilise organisations to strive to achieve a different future (see e.g. Christensen et al., 2013; Cho et al., 2010). This raises a question as to whether mandatory requirements to report on strategy (such as ASIC, 2013) and encouragement to disclose forward looking information (IIRC, 2013) could influence corporate aspirations themselves. This possibility is reinforced by Cho et al. (2015) who suggest that the concepts of organisational facade and organised hypocrisy raise the possibility of individual organisational actors improving an organisation’s social and environmental performance. The different future to which these authors refer could include a future where creating value for stakeholders is seen as essential to creating value for shareholders as it is in company reports examined by Adams et al. (2016). Linked to this, Hahn et al. (2014) present business case and paradoxical frames as being at two ends of a continuum as to how managers conceptualise corporate sustainability. The business case frame is presented as being fully aligned with economic goals and the paradoxical frame as being a combination of interrelated but conflicting social, environmental and economic goals. In the paradoxical frame managers deal with a high level of diversity of attributes and a high level of complexity and diversity of interconnections between the attributes. They scan more broadly considering a wide range of aspects of sustainability issues and consider non-financial information in decision making. Hahn et al. hypothesised that, in contrast, managers with a business case frame would only consider sustainability issues that they regarded as having business relevance and information about those issues which is seen as similar to business information, i.e. typically quantified. They are also likely to only consider sustainability issues over which they perceive they have a high degree of control. Hahn et al. (2014) is particularly pertinent in understanding organisational dynamics in developing integrated thinking, a term used by practitioners to denote a way of thinking about the business of an organisation more holistically rather than in silos. How does integrated reporting, which is intended to encourage integrated thinking (IIRC, 2013), influence managers’ cognitive frames? The characteristics of the paradoxical frame described above might be considered desirable features of integrated thinking and a broader understanding of value creation. On the other hand any attempt to monetise the non-financial outcomes of the value creation process might encourage a business case frame (see Coulson, 2016; Cooper and Senkl, 2016). What is the perceived relationship between the management and governance of ESG risk, strategy development and value creation? What role does corporate reporting (including the processes to develop corporate reports) and cognitive framing play in mitigating these relationships? Following the approach of Miles et al. (2014) the conceptualisation in Figure 1 informed the framing of both the research question and the interview questions and also the data condensation process. The framework itself was developed through a review of theoretical and empirical literature and various forms of engagement work involving informal discussions with board directors, chief financial officers and heads of sustainability. The selection of two countries, with significant social, environmental, political and institutional differences is based on the assumption that national, as well as international, contextual factors will be significant mitigating factors (“external contextual factors” in Figure 1). The very different social contexts lead to different ESG risks impacting on value creation. Further, there are significant differences in governance and reporting requirements between the two countries. Companies on the JSE are required to have a social and ethics sub-committee and board approval of mandatory integrated reports whilst NEDs of ASX listed companies are subject to directors’ liability legislation. Companies listed on the JSE have had experience of using integrated reporting since 2010. In contrast, whilst required to report on strategy and context, there is no requirement for integrated reporting by ASX companies. These differences in governance and reporting requirements and practices allow investigation of how corporate reporting and governance requirements and practices influence the relationship between ESG, strategy and value creation depicted by the conceptualisation in Figure 1. (2) the role of corporate (sustainability and integrated) reporting (including reporting processes) in managing risk and creating value for companies and their stakeholders. The approach to interviewee selection involved strategic, purposive and convenience sampling (see Miles et al., 2014). It was strategic and purposive in seeking views of board chairs and NEDs of the very largest listed companies. These are experienced business leaders who are influential in shaping the relationship between business and society and determining the extent to which corporate strategy is linked to value creation. With respect to the South African sample approaches to potential interviewees were made through the company contact e-mail addresses on the JSE, web searches of board chairs identified company websites and personal contacts based in South Africa. In Australia approaches to board chairs were made through personal contacts working in the companies concerned, the company secretary and other interviewees. The purpose was to achieve samples which were matched in terms of national prominence and (stated/perceived) commitment to social responsibility and sustainability (e.g. through being in the JSE 2014 SRI index, winning awards for corporate social responsibility and/or sustainability or integrated reporting). All directors approached agreed to be interviewed, with the exception of two companies involved in mining, one South African and one Australian, the chairman of the Australian mining company advising that interviewing a NED was “not possible”. The total sample of 16 interviewees had experience in a range of sectors including property, mining, banking, manufacturing and retail. The South African sample of seven interviewees included five board chairs of JSE listed companies including two in the Top 40 Index and a group senior executive responsible to the board on risk reporting. All five of the board chairs had NED positions in other JSE listed companies and a further interviewee had NED positions in JSE listed companies. All but one of the chairs/NEDs was on the board of a company included in the JSE 2014 SRI Index. The sample included two corporate lawyers, two chartered accountants, one self-declared environmentalist active in conservation, someone who had been involved in the development of the King III Code and at least two honorary/adjunct university professors. All interviewees were male and, relevant in post-apartheid South Africa, four of the seven were white. At least one of those four had been heavily involved in the anti-apartheid movement. The Australian sample of nine interviewees comprised one former multinational corporation board chair, four current or former NEDs of ASX 20 companies, one NED of an ASX 100, one executive director of wholly owned companies formally on the ASX, one group head of sustainability of an ASX 50 company and one NED of private and public sector companies involved in reporting/assurance developments at a global level with considerable insight into non-financial reporting issues of ASX listed companies. The sample included four accountants, two economists and an engineer. Three were women. The status, industry and number of board positions held by individual interviewees is not provided. The interviewees are high-profile people and providing this level of detail may reveal their identity. These senior interviewees were thus free to speak their minds. Interview preparation involved familiarisation with the background of the interviewees and the reporting of the companies in which they held key board positions. Interviews were recorded and transcribed verbatim with transcriptions being checked by the researcher. Interviews lasted approximately one hour. The interviews were semi-structured with the initial questions designed to stimulate reflection. Follow up questions provided deeper insights into the relationships between the factors being considered. Following Miles et al. (2014), the data condensation process involved the author listening to the interview recordings and reading the transcripts several times to: identify themes and issues arising in the data; and, organise the data around both the research questions (derived from the conceptualisation in Figure 1) and the themes and issues which emerged during the interviews. This was an iterative process which involved developing mind maps, adding comments to the data and organising and re-organising it. The high level of familiarity with the data which ensued facilitated the author’s understanding of the interrelationship between the various factors at play and through this inductive-deductive coding approach (Miles and Huberman, 1994), four broad nodes codes were identified, namely “social and environmental factors”, “institutional factors”, “governance and corporate practices” and “implications and outcomes”. The broad node codes were informed by the conceptualisation and developed from the literature, the author’s prior knowledge of the issues and the specific circumstances in each country. These broad codes were then broken down into a set of specific codes which differed in each country sample. The specific codes emerged entirely from the data. The coding scheme and key findings for each specific code arising from the data are summarised in Tables I and II. 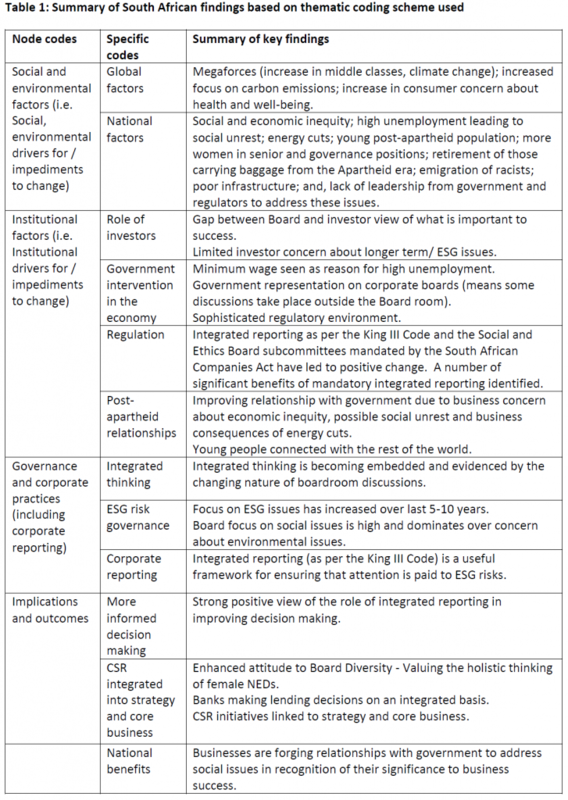 The South African interviewees without exception had a high level of awareness of the impact of social issues on long term business success and were broadly in agreement as to what those issues were (see Table I), how they might impact on their businesses and how they might be resolved. Whilst there was some awareness of environmental issues across all interviewees there were differences in emphasis and understanding of their likely future impact on business. The South African Board Directors raised varying levels of concern about the governance of government. In most cases this level of concern could be described as high. The interview data pointed to exceptional leadership, a concern for the future of their country, the mandatory (by the South African Companies Act) social and ethics board sub-committee and the requirements of the King III Code with respect to integrated reporting being key enabling factors in creating value for shareholders and other stakeholders. The level of awareness of and responsiveness to ESG issues amongst the Australian interviewees was more varied and was not as natural or engrained. This may reflect the lack of consensus which emerged on both key drivers for change and top ESG issues (see Table II). Thinking was more traditional or constrained (e.g. by reporting to short-term investors) and, unlike the South African sample, there was no sense of urgency for change from the perspective of pressing issues or of realising benefits. Directors’ liability legislation was seen as a barrier. Whilst most interviewees could articulate what integrated thinking and a broader view of value creation might mean, there was a sense that, whilst there had been change, the corporate climate was not where it ought to be. 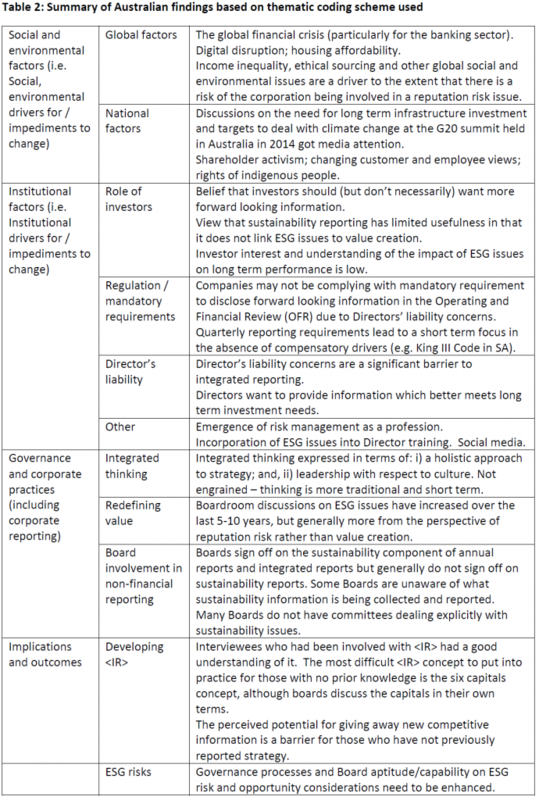 A number of Australian interviewees expressed a view that boards were not sufficiently aware of ESG risk and opportunities or their impact on business (an awareness which is forced upon South African Board directors through the King III Code). The key findings are further elaborated under headings which correspond to the conceptualisation represented in Figure 1: approaches to ESG risk and opportunity, long-term strategy and value creation; and, the role of governance and corporate reporting in value creation. This section discusses interviewee perspectives on ESG risk and opportunity and their integration into long term strategy to create value (the circles in Figure 1). Perspectives on this emerged through questions posed about the external context, ESG risk governance and long term strategic planning. These questions addressed perceptions of integrated thinking and ESG risk identification processes. Of concern, few of the interviewees identified global sustainability megaforces for change (CPA Australia et al., 2014; KPMG, 2011) influencing their strategy although Aus5 noted that they: “are very real, they’re very complex, they’re increasingly interconnected”. SA6 was the only interviewee who had linked them to strategy and value creation having foreseen a world-wide increase in demand for organic products some 20 years earlier linked to the growth of middle class mothers not wanting to “poison their children”. That foresight paid off and SA6 has now turned attention to making the supply chain more socially and environmentally responsible noting: “We’ve got to make money to survive and we’ve got to make the world around us survive” (SA6). Other interviewees were aware of trends such as the high level of concern amongst younger people about the environment (SA3, SA5, SA6, Aus8) and significantly changed customer views on how they “measure our creation of value for them” (Aus5). Aus5 was critical of Australian business colleagues who felt there was no need to change because the local customer and investor base was not concerned about these issues missing the point that globally “the …movement of the superannuation funds… asking for it is going to increasingly drive it”. There is an awareness… But forgive me for being entirely practical – at board level the majority of directors tend to discuss, or they invest time, and debate, in matters they can do something about, and matters that will make the business better, and more bulletproof. This sense that the risk was not within their control and distant was reiterated by SA1 who noted that when a board member raised concerns about rising sea levels anticipated in 90 to 100 years’ time “We all laughed at him”. Poor incorporation of global sustainability trends into strategy in Australia was confirmed when interviewees ( particularly Aus4, Aus5, Aus6 and Aus8) expressed scepticism about whether most Australian boards could even identify their top three ESG risks, despite the link between strategy and ESG risk articulated by Aus2: “…you can’t really have a sensible strategy without understanding the risks attached to it”. However, there was evidence that Boards consider ‘ESG type issues’ (Aus3) and carbon emissions (Aus1) when considering major investment opportunities. The data revealed very different national level drivers in the two countries studied primarily reflecting the significant social issues in South Africa impacting on business (see Table I). This dominated South African Board discussions on ESG issues with some reference also to energy, water and food security. There was particular concern about: the immorality of high unemployment (referred to by SA6 as a sin); and, the impact of poverty and working away from families on productivity and disposable income. Concerns were also expressed about the lack of skills in the potential workforce: the “knowledge and skills base is not in alignment with the needs of a modern economy” (SA2). Interviewees wanted to work with government to address these social issues which they explicitly identified as impacting on value creation. Interviewees SA1 and SA6 spoke of concern about speaking out because the government exerted control through, for example, the ability to grant banking and mining licences. In contrast, whilst the Australian interviewees identified a number of national-level drivers (see Table II) all playing a role in change, none emerged as dominating all others. “There’s this tension between reporting on a quarterly basis, which is incredibly short term for companies, and… longer term growth…. The average shareholding by the big asset management companies is quite short too. So it is hard… for a company. No I don’t think the balance is right. I think the reputational issue is a very real factor in longer term profitability… I think we’ve got a long way to go… it’s a bit hard to invest in something which you can say it’s going to bring us a return in 7 to 10 or 15 years. …those that will take notice of it are those who’ve had disasters…. But unless you’ve been burned, it’s very hard to go into a board and say, ‘We really need to invest heavily in this and, by the way, it’s impossible to make it break even’. These tensions between what is expected by shareholders and what NEDs believe is necessary might lead to what Cho et al. (2015) refer to as hypocrisy of strategy. The majority of Australian interviewees expressed frustration at the lack of investor understanding about ESG issues and their short term investment horizon as an impediment to long term value creation. …boards vacillate a bit between thinking short term and long term, not because they want to but because there’s… pressure on them (Aus3). There’s enough money to pay to invest in infrastructure but they (pension funds) won’t invest long term because they don’t know enough about, well, are these guys going to be around in five years. Consistent with the findings of ACCA and Eurosif (2013), Atkins and Maroun (2014) and Ioannou and Serafeim (2015) Aus1 indicated a potential to influence the cognitive framing of investors to demand, and see relevance in, increased ESG information perceived it as relevant to value creation. There are many, many leaders, particularly the younger ones, and very often, and I’m not patronising you, very often the women who… can actually see the benefit of … integrating and creating. Somebody asked me why I’m so strong on the women in the company … there’s still that nurturing, they’ve got that ability to make the company a home, to see that all the rooms interlink. They can understand integrated reporting…]. They can see how if all of this comes together it will create a business…. So I honestly believe that it’s a characteristic of women… (SA3). These interviewees then were identifying leadership, diversity, determination and use of shared goals as means of influencing a dominant business case frame towards a more paradoxical frame which was seen as more desirable (Hahn et al., 2014). So let’s take this energy crisis that the country is experiencing currently. If the board sees that as a serious risk… because it will impact the future sustainability of this organisation … if we want to then address it … so that we don’t extend our carbon footprint negatively through adding additional diesel generators to our current property portfolio, then that’s going to have a negative impact on our short term income statement, but a positive impact on our sustainability … that’s the summarised view that you can present to your board. We can position it to say, even though the cost is high, it affords you as a board an opportunity to brag about what you’re doing (SA4). Absolutely, because if you do it sincerely, you can leverage it in terms of creating value for the organisation in the long term, and you can use it to market yourself in the community and again, if you do it sincerely, people will buy into what you’re doing…. I think the South African community has so shaped the [name of company] brand, with sustainability as well …it’s a nice story that is associated with the brand. There’s a reliability factor, there’s a trust factor that’s got into the brand (SA4). I could articulate [name of company] as being a construction property, or I can articulate [name of company]’s purpose …to create …a future for communities and people to prosper. Very different…. I’m actually creating place where people want to spend their time to live, to work, to play…. A clear understanding that that’s what I’m doing will unite functions and line management (Aus5). …our strategy was done holistically and so citizenship was a core strategy and a core objective for the leadership team and we wanted to make it real for every staff member. …we need to change the way people feel about us as a company…. We need every staff member to be able to articulate the contribution we made to the community, the industry and society. The views expressed by Australian interviewees with regard to the development of integrated thinking are indicative of the relatively limited extent of integration of ESG risk into corporate decision making and strategy. As another Australian interviewee who had served on the board of a bank put it: “I think at the moment we’re in our infancy and you’re seeing … the lack of involvement of …the bankers in ESG”. The superior experience and know-how of South African managers in achieving integrated thinking was underlined by Aus4: “(name of related South African company) are five years in front of us”. The responses highlight how integrated thinking and long term strategic thinking are seen as critical to the integration of ESG issues into strategy, which in turn is considered important in creating value. This section discusses the extent to which governance processes, corporate practices and corporate reporting in particular (the black rectangles in Figure 1), were found to shape outcomes with respect to value creation, particularly through the consideration of ESG risk and opportunity in strategy development. It (integrated reporting) led to the implementation of a more holistic, or a more integrated approach. And it has certainly enhanced the quality of governance. One has to have a holistic view, which is what integrated reporting has done for the board rooms…. One can’t just focus on the financial statements. It’s far too narrow. And it definitely has changed the mindset of board members…. I think integrated reporting has done wonders in terms of getting board members to apply their minds more widely (SA4). Very, very simply… five years ago, when I spoke to somebody, they spoke about their department. Now they speak about the company, and the impact that their department will have on another department and on the company… they actually understand the benefit of talking to each other (SA3). Overall the South African interviewees were unanimous in support for integrated reporting stating the benefits as being: provision of a framework for following an approach which they think makes good business sense and legitimises that approach (e.g. focussing on increased customer demand for socially and environmentally responsible products); encouraging board members to think more broadly about the business context and develop a more informed strategy which takes account of ESG risk and opportunities; increasing emphasis on long term strategic issues (e.g. innovation in product development which addresses social and environmental issues); improving the quality of risk identification, measurement and management; and, improving corporate brand by engaging in social investment activities that link with strategy. …integrated reporting is part of our DNA … we can’t believe there are jurisdictions where it’s not mandatory. Sometimes it’s hard to believe that a shareholder doesn’t know …isn’t being told the story on an integrated basis, that there are countries that still report in silos. What we know now because of the journey with integrated reporting is [that] you know nothing about the company when you report in silos. Until you’ve integrated and you know the story and you see the impact of what one division has on another, you can’t make an investment decision… (SA3). …if I … just think about the companies I’m involved in, the quality of risk management … and the effectiveness of risk management, and the visibility of risk management, has increased dramatically, dramatically (SA2). The first meeting actually changed my whole attitude which scared me. Scared is not a bad thing… scared in the right sense that it actually triggers your mind into action…. This interviewee went on to further elaborate how thinking about value creation in broader terms than the financial statements changed his thinking about how to do business, focussing more on the long term and thinking about opportunities and risks. Integrated reporting moved this board director’s cognitive frame closer to Hahn et al.’s (2014) paradoxical frame increasing his consideration of social and environmental issues and seeing their connection with economic issues. Changes to cognitive framing also came from giving the capitals, for example, human capital, “real status in an organisation” (Aus3). Indeed a number of interviewees demonstrated an awareness of the potential for “human capital” and the conditions under which people worked to influence both the bottom line and broader value creation. For example: “you can get 90% of the women who go on maternity leave to come back you are picking up an enormous amount of additional money value” (Aus3). SA7 explained how the impact of redundancies was now considered in human-centric terms whereas previously only financial impacts were considered. There was some scepticism regarding the extent of change that could be brought about by reporting with interviewee (Aus7) cautioning that we would see a lot of “fake integrated reporting” expressing a view that “the most disintegrated companies can produce an integrated report”. Whilst stressing that integration requires leadership, this interviewee considered integrated reporting to be a step in the right direction albeit “the tail wagging the dog to a certain extent”. Concerns raised about integrated reporting included: reliability (the African Bank failed despite having a good integrated report as per EY, 2014); does not compensate for a lack of integrity; possibility of ‘fake’ integrated reports where companies are ‘disintegrated’; time consuming; costly; difficult to find a balance between disclosing strategy and undermining competitive advantage. There’s no doubt about it. 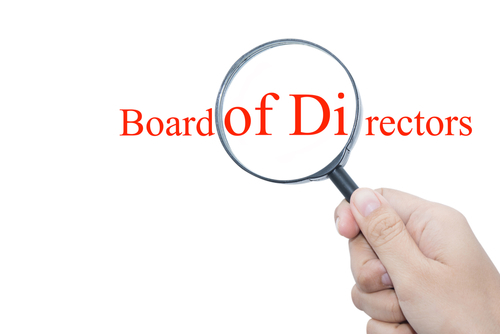 With the focus on the responsibilities of the directors now more clearly enunciated and directors very much aware that they have to be serious about it, the preparation of an annual report or quarterly reports that is integrated focuses the mind and there’s no doubt about that. It would be strange if it weren’t. … it’s only when you’re asked to do something that you start searching for the answer and I think that’s a very good process… some might say it’s box-ticking and there possibly is an element of that, but the very fact that you’re asked to think about it will get most people more alive to it and in time they’ll realise these are real risks (Aus8). 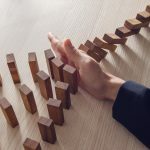 A notion that risk management is a parallel process to citizenship and corporate social responsibility is a parallel process to the widget sales, is the root cause of disconnection and the reason why we don’t deal with these things in a clear, coherent way. Reflecting on the role of governance and ESG risks in value creation, Aus3 and Aus7 agreed there is a need for boards to include an understanding of ESG risks in the board skills matrix. Aus2 saw significant opportunities for the accounting profession to add value to boards, management and investors through external assurance of non-financial information and through internal audits. Contrary to the simplistic mantra of legitimacy theory and the evidence which has been found to support it (see e.g. Patten, 1992; Deegan et al., 2002), a number of the interviewees spoke of the importance of transparency: “you’d rather let it hang out there… than come back later to address a shortcoming” (SA5); “boards should ask themselves the question all the time: are we being transparent enough? …there’s just no reason to be anything other than 100% transparent” (Aus3); “I’ve never been in any discussion where people have said… it’s a risk, we don’t want to disclose” (Aus9); “we should be disclosing as much as we possibly can” (Aus6). Countering this, a minority of interviewees noted that such views were not shared by some board colleagues. The interview findings increase our understanding of the complex interrelationships which influence the ability of companies to create value, broadly defined (see Figure 1) and they highlight nuances in these interrelationships which are neither apparent in the extant literature nor explained by prior theorising. A number of examples of a broader view of value creation emerged from the interviews and are supported by Adams et al.’s (2016) examination of corporate reports over the period in which the integrated reporting framework was developed. A broader concept of value creation was something all of the interviewees had given some thought to in recent years albeit to different degrees. South African interviewees clearly articulated a link between national social issues and value creation and also provided examples of economic and social value creation being enhanced through opportunities identified from considering these issues. One particular interviewee stood out as a leader who had sought, and succeeded in identifying opportunities which served society’s interest, decreased negative environmental impact and resulted in business growth. He observed global, as well as national trends. Other examples related to particular initiatives and issues around employees (human capital, to use the term in IIRC, 2013), the environment (natural capital) and relationships with customers, government and other stakeholders (social and relationship capital). This has occurred in the context of increased demand from customers, employees and even banks providing funding for social and environmental responsibility. The South African interviewees had strong views that business had a role in addressing social issues and they put forward a number of suggestions as to how this might be done whilst simultaneously further enhancing corporate value creation: improving education to increase capability; increasing corporate social investment; and, better collaboration between business and government to make sure regulation makes sense. Thus they espoused a broad view of value creation where ESG issues, particularly national level issues, played an important role. The visibility afforded by the mandatory requirement to prepare an integrated report and consider ESG issues at board (sub-committee) level was clearly a factor shaping their views (see Burchell et al., 1985; Miller and Power, 2013 regarding implications of making issues visible). Whilst Australian companies had not embraced a broad view of value creation to the same extent, there was evidence that those that had considered integrated reporting linked it with an enhanced awareness of ESG issues albeit starting from a low base. The interviews suggest that integrated reporting with its broader view of value creation through “integrated thinking” sets the scene for a more paradoxical frame (as per Hahn et al., 2014). The interviewees’ notions of integrated thinking might be thought of as increased paradoxical thinking moving cognitive framing of ESG issues closer to the paradoxical frame. Consistent with Hahn et al. (2014), board chairs and directors of major listed companies were not influenced by global sustainability megaforces (KPMG, 2011) over which they had limited control. National contextual issues, with a more immediate impact, on the whole proved to be more dominant. Those board members with experience of integrated reporting demonstrated a greater awareness of the interconnectedness of social, environmental and economic issues. Further, consistent with Hahn et al.’s (2014) paradoxical frame they attach greater importance to non-financial performance measures. In South Africa, in particular, integrated reporting was found to increase attention on ESG issues and the longer term and was associated with a changed mindset that value creation for business that was linked to creating value for society. Although not a key focus of the research, the interviews supported prior work identifying a relationship between board diversity (in gender and expertise), a focus on ESG issues and perceptions of improvement in (CSR) performance (see Harjoto et al., 2015; Isidro and Sobral, 2015). Explicit references by two male interviewees about the ability of women to make connections between complex issues indicate the potential value in research examining the role of gender in cognitive framing on sustainability issues. The research also finds that the very different national contextual issues (see Tables I and II) impacting on companies in the two countries studied have influenced both the nature of ESG issues considered and the extent to which ESG issues are considered in determining strategy. It supports the view that disclosure of strategy (or aspirational future talk) can inspire business leaders to achieve a different future (Christensen et al., 2013; Cho et al., 2015), including one aligned with value creation for stakeholders. The strategy described by the Chairman of a retail food company of increasing social approval by donating to the poor, at the same time as allowing the company to increase value by providing fresher and hence better quality produce to customers, gives the company the ability to be more defensive at the onset of a (social, environmental or governance) crisis (see Bundy and Pfarrer, 2015). In the absence of investor interest, integrated reporting with its focus on integrated thinking was found to provide an initial framework and discipline for considering ESG risk issues and focussing on the longer term, changing director mindsets and influencing decision making. The South African sample and those Australian interviewees with experience of integrated reporting noted considerable (positive) changes brought about by integrated reporting. These changes related primarily to the changes in thinking initiated by integrated reporting; and, the additional information collected and made visible to the board (which further changes thinking and influences decision making). There are a number of factors that, taken together, make the study particularly important: the link between ESG risk, reputational damage and delivering on strategy; some evidence of increasing investor demand for information on ESG risks; the importance of board involvement in integrating environmental and social sustainability into corporate practices; increasing regulatory and stock exchange requirements to disclose both ESG risks and strategy; global discussions on the role of corporate reporting in achieving the SDGs; and, the trend towards integrated reporting. The interrelationships (depicted in Figure 1) represent the contemporary value creation process or what practitioners and the IIRC refer to as “integrated thinking”. It depicts a wide range of external contextual factors, including social and environmental factors and institutional factors) being considered by organisations, a process which allows the identification of ESG risks and opportunities. These are fed into long term strategy development and their consideration also assists organisations in delivering on their strategy to create value as broadly defined. The IIRC’s integrated reporting framework and the King III and King IV Codes in South Africa set out processes, including governance requirements, which encourage this type of integrated’ thinking. This is of course mitigated by individual actors and leaders. For example, whilst most interviewees do not consider ESG issues as much as various sources quoted (such as KPMG, 2011) suggest that they should, this is explained in the conceptualisation as being due to the existing cognitive framing of managers as per Hahn et al. (2014). Enhanced understanding of the interrelationships in Figure 1 can inform national and global discussions on the appropriateness of current dominant corporate reporting and governance models to achieve sustainable development. The cross-country comparison allows an assessment of the extent to which different national social contexts with differing governance and reporting frameworks lead to different perspectives on value creation. The study confirms that approaches to non-financial corporate reporting, which include board involvement, are critical in determining the outcomes of these interactions between approaches to ESG risk and approaches to the firm’s strategy for value creation. This author suggests that new understandings arising from this research will facilitate greater alignment of value creation outcomes with sustainable development and can inform recommendations and framework developments, particularly with respect to corporate contribution to the SDGs. Thus the research findings have implications for government policy, corporate governance practices and the accounting profession. Governments can better influence social, environmental and economic outcomes for companies, their nations and their people. In South Africa the government can take advantage of the increased awareness of what creates value and the consequential strong desire of business (expressed by the interviewees) to help improve the well-being of the nation’s people and its competitiveness. In Australia government policy could seek to remove or counter constraints due to directors’ liability legislation and the gap between Board and investor interest in ESG risk that prevents businesses from seizing opportunities resulting from global sustainability megaforces. It could strengthen requirements that facilitate companies in identifying and responding to such opportunities. There is a role for ASIC and the ASX to assist with this. South Africa provides an example of how such interventions can provide a counter force to attitudes of investors which limit long term economic and social prosperity. This research demonstrates that the emerging business paradigm is at odds with accountants’ traditional narrow perspectives. Accountants maintain powerful influence in companies and on Boards and they have a presence on corporate internal audit teams which have an important role in governance. Accountants are not assisting, and perhaps hampering, long term value creation. The need for greater skills in non-financial accounting, reporting and auditing and for a wider perspective on business externalities is apparent. Further research is needed to inform the practical implementation of these recommendations. The recent emergence of ESG risk management as a profession and the emerging understanding of its link with setting and delivering on strategy (which needs further research) and the increasing importance attached by business to a broader view of value creation has significant additional implications for business school education. The need for knowledge and awareness of environmental and social issues to be included in board skills’ matrices was also apparent through the interviews and explicitly called for by some interviewees. This study has focussed on the perspectives of NEDs. Future research may consider whether the perspectives articulated here are reflected in corporate reports. For example, further research might: develop the work of Cho et al. (2010) by examining the extent to which optimistic language in forward looking statements and strategic overview sections of integrated reports mask poor performance, or indeed, might encourage better performance; examine the extent to which integrated reporting demonstrates a portrayal gap (Adams, 2004) and hence evidence of camouflaging (Michelon et al., 2016); test the relationships set out in Figure 1 both quantitatively and qualitatively; examine the influence of the relationships between board members and managers on the relationships depicted in Figure 1; and, explore in detail the influence of integrated reporting and “integrated thinking” on managers’ cognitive frames particularly their positioning on the business case vs paradoxical frame continuum (see Hahn et al., 2014). Further, the emergence of the new practices considered here might be problematized (see e.g. Miller, 1991). Such research might shed further light on the link between integrated reporting, governance and integrated thinking. Whilst as little as a decade ago the possibility of companies contributing to the SDGs and sustainable development would not have been thought possible by this author (see Adams, 2004) (who remains sceptical about the public relations fluff, omissions and untruths in many corporate reports), this research provides evidence that this is happening (notwithstanding the ongoing concerns of Gray, Milne and their co-authors). And initiatives such as those of stock exchanges, the IIRC, GRI and UN Global Compact with respect to corporate reporting and governance practices have a part to play. 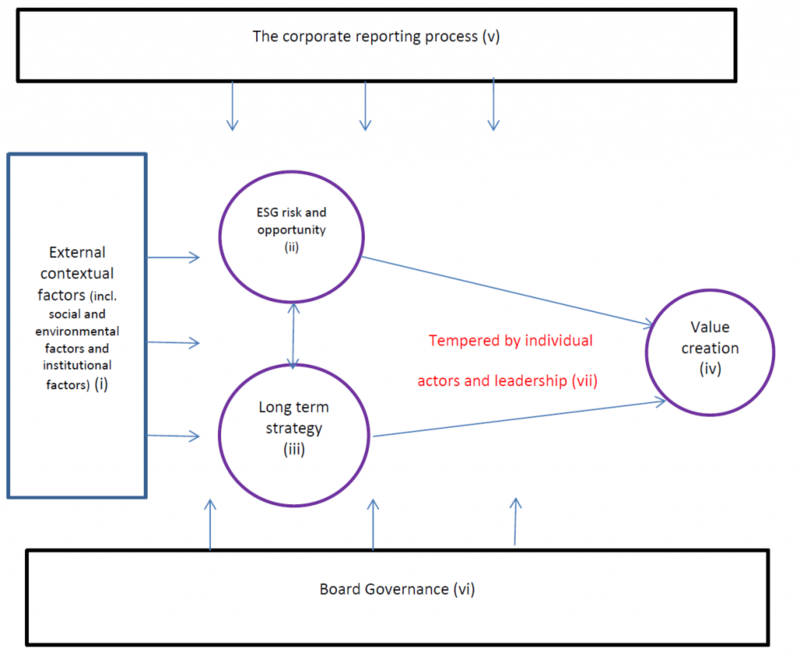 The IIRC’s decision to focus on value creation (rather than just impacts) and to require Board sign off on integrated reports appear to have influenced the mindset of corporate leaders in a way that decades of sustainability reporting have not. The interviews shed light on the nature of “integrated thinking” involved in the value creation process. The author would like to thank the interviewees for their generosity with their time to allow this research to be undertaken. The author is grateful to those who helped in establishing contact with potential interviewees, but have not disclosed their names in order to maintain anonymity of the interviewees. The author would like to thank CPA Australia and the University of Pretoria for providing funding to support this research and Rene Swart for making sure the author got to the interviews in South Africa. The author is grateful for feedback from Mark Learmonth, Venkat Narayanan, Brad Potter, Sandra Waddock, Chris Van Staden and participants in seminars at the University of Queensland and Swinburne University and at the EMAN conference at Leuphana University and the CSR conference at Humboldt University in 2016. The guidance provided by Lee Parker and anonymous referees has been valuable in revising the paper. For these purposes value creation is defined broadly, i.e. including but beyond just the pursuit of profit, as it is in integrated reporting (see IIRC, 2013), but see EY (2013) for a summary of other approaches. It should be noted, however, that under the King III Code which was in South Africa in 2015 when the research was conducted, the notion of value creation is somewhat less organisation-oriented and closer to the notion of value-creation stakeholder accounting put forward by Mitchell et al. (2015). See, for example, IIRC (2013, p. 10): “The ability of an organization to create value for itself is linked to the value it creates for others” and also Adams et al., 2016. The Companies Act No. 71 of 2008 was signed by the president on 8 April 2009 and gazetted in Gazette No. 32121 (Notice No. 421). The Act replaces the Companies Act, 61 of 1973 and came into effect on 1 May 2011. This approach to developing and elaborating on a conceptualisation follows that of Adams (2002). See, for example, www.accountingforsustainability.org/integrated-thinking/10-main-elements-toembed-sustainability; www.ifac.org/publications-resources/creating-value-integrated-thinking (accessed 12 April 2016). See www.cbussuper.com.au/about-us/annual-report; www.vicsuper.com.au/about-us/reports (accessed 30 September 2016). It should be noted that the interviews for Stubbs and Higgins research were conducted in 2012 prior to the publication of the IIRC’s International <IR> Framework (IIRC, 2013). The UK Companies Act 2006 (as amended in 2013) also now requires companies to prepare a strategic report. In both samples a number of interviewees had additional Board roles aside from the most prestigious role mentioned here. ACCA and Eurosif (2013), What do investors expect from non-financial reporting?, ACCA. ACCA and the Net Balance Foundation (2011), Adoption of integrated reporting by the ASX 50, ACCA. ACSI (2014), Corporate reporting in Australia, ACSI. ACSI (2015), Corporate reporting in Australia, ACSI. Adams, C.A. (2002), “Internal organizational factors influencing corporate social and ethical reporting: beyond current theorising”, Accounting, Auditing and Accountability Journal, Vol. 15 No. 2, pp. 223–250. Adams, C.A. (2004), “The ethical, social and environmental reporting-performance portrayal gap”, Accounting, Auditing and Accountability Journal, Vol. 17 No. 5, pp. 731–757. Adams, C.A. (2013a), Understanding Integrated Reporting: The Concise Guide to Integrated Thinking and the Future of Corporate Reporting. Dō Sustainability. Adams, C.A. (2013b), “Sustainability reporting and performance management in Universities: challenges and benefits”, Sustainability Accounting, Management and Policy Journal, Vol. 4 No. 3, pp. 384-392. Adams, C.A. (2014), Sustainability and the company of the future”, in “Reinventing the company in the digital age. BBVA OpenMind, available at https://www.bbvaopenmind.com/wp-content/uploads/2015/02/BBVA-OpenMind-book-Reinventing-the-Company-in-the-Digital-Age-business-innovation1.pdf (accessed 18 April 2016). Adams, C.A. (2015), “The International Integrated Reporting Council: a call to action”, Critical Perspectives on Accounting, Vol. 27, pp. 23-28. Adams C.A., Coulson A.B., Emmelkamp T., Greveling R., Klüth G. and Nugent M. (2013), Capitals Background Paper for . IIRC. Adams, C.A., and Larrinaga-González, C. (2007), “Engaging with organizations in pursuit of improved sustainability accounting and performance”, Accounting, Auditing and Accountability Journal, Vol. 20 No. 3, pp. 333–355. Adams, C.A., and McNicholas, P. (2007), “Making a difference: Sustainability reporting, accountability and organizational change”, Accounting, Auditing and Accountability Journal, Vol. 20 No. 3, pp. 382–402. Adams, C.A., Potter B., Singh P.J. and York J. (2016), “Exploring the implications of integrated reporting for social investment (disclosures)”, British Accounting Review, Vol. 48, pp. 283-296. Adams, C.A., and Whelan, G. (2009), “Conceptualising future change in corporate sustainability reporting”, Accounting, Auditing and Accountability Journal, Vol. 22 No. 1, pp. 118–143. AICD (2014), RG 247 and the International Integrated Reporting Framework. Archel, P., Husillos, J. and Spence, C. (2011), “The institutionalisation of unaccountability: Loading the dice of Corporate Social Responsibility discourse”, Accounting, Organizations and Society, Vol. 36 No. 6, pp. 327-343. ASIC (2013), ASIC Regulatory Guide 247, ASIC. Atkins, J. and Maroun, W. (2014), South African institutional investors’ perceptions of integrated reporting. ACCA. Black Sun and IIRC (2014), Realizing the benefits: the impact of integrated reporting, available at http://integratedreporting.org/wp-content/uploads/2014/09/IIRC.Black_.Sun_.Research.IR_.Impact.Single.pages.18.9.14.pdf (accessed 7 January 2016). Bundy, J., and Pfarrer, M.D. (2015), “A burden of responsibility: the role of social approval at the onset of a crisis”, Academy of Management Review, Vol. 40 No. 3, pp. 345–369. value added in the United Kingdom”, Accounting, Organizations and Society, Vol. 10, pp. 381–413. Cheng, M., Green, W., Conradie, P., Konishi, N. and Romi, A. (2014), The International Integrated Reporting Framework: Key Issues and Future Research Opportunities. Journal of International Financial Management and Accounting. Vol. 25 No. 1, pp. 90-119. Cho, C.H., Laine, M., Roberts, R. W., and Rodrigue, M. (2015), “Organized hypocrisy, organizational façades, and sustainability reporting”, Accounting, Organizations and Society, Vol. 40, pp. 78–94. Cho, C.H., Roberts, R.W., and Patten, D.M. (2010), “The language of US corporate environmental disclosure”, Accounting, Organizations and Society, Vol. 35, pp. 431–443. Christensen, L.T., Morsing, M. and Thyssen, O. (2013), “CSR as aspirational talk”, Organization, Vol. 20 No. 3, pp. 372-393. Contrafatto, M. (2014), “The institutionalization of social and environmental reporting: An Italian narrative”, Accounting, Organizations and Society, Vol. 39, pp. 414–432. Cooper, C. and Senkl, D. (2016) “An(Other) truth: A feminist perspective on KPMG’s True Value”, Sustainability Accounting, Management and Policy Journal, Vol. 7 No. 4. Correa, C. and Larrinaga, C. (2015) “Engagement research in social and environmental accounting”, Sustainability Accounting, Management and Policy Journal, Vol. 6, No. 1, pp. 5-28. Coulson, C. (2016) “KPMG’s True Value methodology: a critique of economic reasoning on the value companies create and reduce for society”, Sustainability Accounting, Management and Policy Journal, Vol. 7 No. 4. Coulson, A., Adams, C.A., Nugent, M. and Haynes, K. (2015), “Exploring metaphors of capitals and the framing of multiple capitals: challenges and opportunities for ”, Sustainability Accounting, Management and Policy Journal, Vol. 6 No. 3, pp. 290-314. CPA Australia, KPMG Australia and GRI Focal Point Australia (2014), From Tactical to Strategic: How Australian Businesses create value from sustainability, GRI Focal Point Australia, Sydney. Deegan, C., Rankin, M. and Tobin, J. (2002), “An examination of the corporate social and environmental disclosures of BHP from 1983-1997”, Accounting, Auditing and Accountability Journal, Vol. 15 No. 3, pp. 312-43. Dent, J. (1990), “Strategy, organization and control: Some possibilities for accounting research”, Accounting, Organizations and Society, Vol. 15, pp. 3–25. Eccles, R.G. (2014), “The Investor Conundrum”, Accountancy Futures, No. 8, pp. 20–21. Eccles, R.G., and Serafeim, G. (2011), “The role of the board in accelerating the adoption of integrated reporting”, Director Notes (The Conference Board), November. Eisenbeiss, S.A., van Knippenberg, D. and Fahrbach, C.M. (2015), “Doing Well by Doing Good? Analyzing the Relationship Between CEO Ethical Leadership and Firm Performance”, Journal of Business Ethics. Vol. 128, pp. 635-651. EY (2013), Value Creation Background Paper, IIRC. EY (2014), Excellence in integrated reporting awards, EY. Flower, J. (2015), “The International Integrated Reporting Council: a story of failure”, Critical Perspectives on Accounting, Vol. 27, pp. 1-17. Gray, R. (2006),”Social, environmental and sustainability reporting and organisational value creation?”, Accounting, Auditing and Accountability Journal, Vol. 19 No. 6, pp. 793 – 819. Gray, R., Adams, C.A. and Owen, D. (2014), Accountability, social responsibility and sustainability: accounting for society and the environment. Pearson. GRI (2014), G4 Reporting Principles and Standard Disclosures. Global Reporting Initiative. GRI, UN Global Compact and WBCSD (2015), SDG Compass: A guide for Business Action to Advance the Sustainable Development Goals, available at https://sdgcompass.wordpress.com/ (accessed 24 July 2015). Hahn, T., Preuss, L., Pinkse, J. and Figge, F. (2014), “Cognitive frames in corporate sustainability: managerial sensemaking with paradoxical and business case frames”, Academy of Management Review, Vol. 39 No. 4, pp. 463-487. Hall, M., Millo, Y. and Barman, E. (2015), “Who and what really counts? Priotization and accounting for social value”, Journal of Management Studies, Vol. 52 No. 7, pp. 907-934. Harjoto, M., Laksmana, I., and Lee, R. (2014), “Board Diversity and Corporate Social Responsibility”, Journal of Business Ethics. Vol. 132, pp. 641-660. Henri, J-F. and Journeault, M. (2010), “Eco-control: The influence of management control systems on environmental and economic performance”, Accounting, Organizations and Society, Vol. 35, pp. 63–80. Huggins, A., Simnett, R., and Hargovan, A. (2015), “Integrated reporting and directors’ concerns about personal liability exposure: Law reform options”, Company and Securities Law Journal, Vol. 33, pp. 176-195.
International Integrated Reporting Council (2013), International Framework, available at http://www.theiirc.org/wp-content/uploads/Consultation-Draft/Consultation-Draft-of-the-InternationalIRFramework.pdf (accessed 19 April 2014). Ioannou, I., and Serafeim, G. (2015), “The impact of corporate social responsibility on investment recommendations: analysts’ perceptions and shifting institutional logics”, Strategic Management Journal, Vol. 36, pp. 1053–1081. Isidro, H., and Sobral, M. (2015), “The Effects of Women on Corporate Boards on Firm Value, Financial Performance, and Ethical and Social Compliance”, Journal of Business Ethics, Vol. 132, pp. 1-19. KPMG (2011), Expecting the Unexpected, KPMG International. Laughlin, R.C. (1991), “Environmental disturbances and organizational transitions and transformations: some alternative models”, Organization Studies, Vol. 12 No. 2, pp. 209-232. Lewin, K. (1947), Frontiers in group dynamics, in Catwright, D. (Ed. ), Field theory in social science, (pp. 143-53), Social Science Paperbacks, London. Llewellyn, S. (2003), “What counts as ‘theory’ in qualitative management and accounting research? Introducing five levels of theorizing”, Accounting, Auditing and Accountability Journal, Vol. 16 No. 4, pp. 662-708. Lodhia, S. (2015), “Exploring the transition to integrated reporting through a practice lens: an Australian customer owned bank perspective”, Journal of Business Ethics, Vol. 129, pp. 585–598. Michelon, G. Pilonato, S. Ricceri, F. and Roberts, R. (2016), “Behind camouflaging: traditional and innovative theoretical perspectives”, Sustainability Accounting, Management and Policy Journal, Vol. 7, No. 1, pp. 2-25. Miles, M.B. and Huberman, A.M. (1994), Qualitative data analysis: an expanded sourcebook, Second ed. Thousand Oakes. California: Sage Publications Inc. Miles, M.B., Huberman, A.M. and Saldaña, J. (2014) Qualitative data analysis. California: Sage Publications Inc.
Miller, P. (1991), “Accounting innovation beyond the enterprise: problematizing investment decisions and programming economic growth in the U.K. in the 1960s”, Accounting, Organizations and Society, Vol. 16 No. 8, pp. 733-762. Miller, P. and Power, M. (2013), “Accounting, organizing, and economizing: Connecting accounting research and organization theory”, Academy of Management Annals, Vol. 7, pp. 557–605. Milne, M.J. and Gray, R. (2013), “W(h)ither Ecology? The triple bottom line, the Global Reporting Initiative, and corporate sustainability reporting, Journal of Business Ethics, Vol. 18, pp. 13-29. Milne, M.J., Tregidga, H. and Walton, S. (2009), “Words not actions! The ideological role of sustainable development reporting”, Accounting, Auditing and Accountability Journal, Vol. 22, No. 8, pp. 1211-1257. Mitchell, R. K., van Burren III, H. J., Greenwood, M. and Freeman, R. E. (2015), “Stakeholder inclusion and accounting for stakeholders”, Journal of Management Studies, Vol. 52 No. 7, pp. 851-877. O’Sullivan, N. and O’Dwyer, B. (2015), “The structuration of issue-based fields: Social accountability, social movements and the Equator Principles issue-based field”, Accounting, Organizations and Society, Vol. 43, pp. 33-55. Parker, L.D (2005),”Social and environmental accountability research: A view from the commentary box”, Accounting, Auditing and Accountability Journal, Vol. 18 No. 6 pp. 842 – 860. Patten, D. (1992), “Intra-Industry Environmental Disclosures in Response to the Alaskan Oil Spill”, Accounting, Organizations and Society, Vol. 17, No. 5, pp. 471-5. Queen, P.E. (2015), “Enlightened shareholder maximization: is this strategy achievable?”, Journal of Business Ethics, Vol. 129, pp. 683–694. Roberts, J. (1990), “Strategy and accounting in a UK conglomerate”, Accounting, Organizations and Society, Vol. 15, pp. 107–126. Simnett, R. and Huggins, A. (2015), “Integrated Reporting and Assurance: Where Can Research Add Value?”, Sustainability Accounting, Management and Policy Journal, Vol. 6, No. 1, pp. 29 – 53. Skærbæk, P. and Tryggestad, K. (2010), “The role of accounting devices in performing corporate strategy”, Accounting, Organizations and Society, Vol. 35, pp. 108-124. Solomon, J.F., Solomon, A., Joseph, N.L., and Norton, S.D. (2013), “impression management, myth creation and fabrication in private social and environmental reporting: Insights from Erving Goffman”, Accounting, Organizations and Society, Vol. 38, pp. 195–213. Steyn, M. (2014), “Organisational benefits and implementation challenges of mandatory integrated reporting”, Sustainability Accounting, Management and Policy Journal, Vol. 5 No. 4, pp. 476 – 503. Stubbs, W. and Higgins, C. (2014), “Integrated Reporting and internal mechanisms of change”, Accounting, Auditing and Accountability Journal, Vol. 27 No. 7, pp. 1068-1089. Unerman, J., and Chapman, C. (2014), “Academic contributions to enhancing accounting for sustainable development”, Accounting, Organizations and Society, Vol 39, pp. 385–394. van der Vegt, G.S., Essens, P., Wahlström, M. and George, G. (2015), “Managing risk and resilience”, Academy of Management Journal, Vol. 58 No. 4, pp. 971–980. UNGC (2010), UN Global Compact Management Model, available at https://www.unglobalcompact.org/docs/news_events/9.1_news_archives/2010_06_17/UN_Global_Compact_Management_Model.pdf (accessed 1st November 2015). United Nations (2014), Report of the Open Working Group of the General Assembly on Sustainable Development Goals Report A/68/970, available at http://www.un.org/ga/search/view_doc.asp?symbol=A/68/970andLang=E (accessed 21st November 2014). The observation that ESG reporting that is not linked to value creation is very interesting. Great work Carol. Excellent explanatory article on comparative integrated reporting related to company and board members responsibilities and responses to legislated change for emerging MBA’s.